World No. 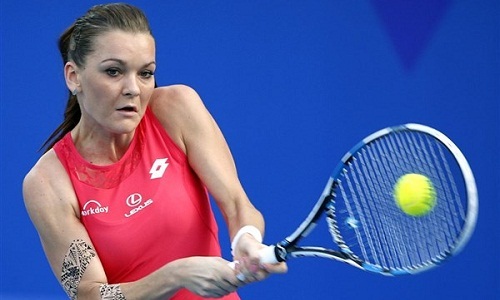 3 Agnieszka Radwanska has pulled out of the upcoming Bank of West Classic due to an injured right hand. The tournament is scheduled to be held from July 18-24 in Stanford, California. Radwanska, who recently suffered a heart-breaking defeat to Dominika Cibulkova in the fourth round of the Wimbledon Championships, caught an injury to her right hand, believed to have goaded during the marathon third set that the Pole lost 9-7. “Unfortunately the right hand injury I suffered at Wimbledon is not 100 percent (fine) and my medical team has advised me to rest,” said the 27-year-old. Radwanska was slated to get the top billing for the tournament, which comprises of some big names including multiple Grand Slam champion Venus Williams and British No. 1 Johanna Konta. She, however, is expected to get back in shape before the Rogers Cup that begins from July 25.
. @BOTWClassic sorry everyone! Hope to see you all next year!!! ❤️??? ?